Free Orgins Mini Facial & Plantscription Youth-Renewing Night Cream & Face Oil!! 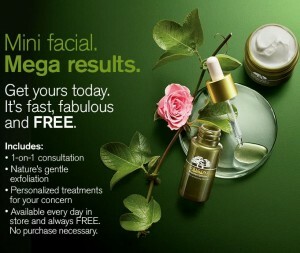 Claim your FREE 20-25 minute mini facial and samples of Origins Plantscription Youth-Renewing Night cream and face oil! Mini Facial not required to redeem FREE samples. Offer valid in the U.S. at Origins Retail Stores and Origins Department Store counters at select Macy’s, Dillard’s, BonTon and Belk. Appointment recommended. Find your local Origins store HERE. Offer expires 10/31/13.